I like Klonoa. Here's a review of Klonoa: Empire of Dreams. Sometimes less is more with these pre-review spiels, no? 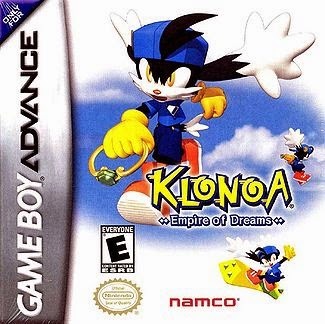 Although it wasn't Klonoa's first foray onto a handheld (the WonderSwan game predates it), Klonoa debuted on the Game Boy Advance with Klonoa: Empire of Dreams, a puzzle platformer with some ingenious design and plenty of brain-busting challenges. It's quite unlike its big brother console iterations, as those games have a higher focus on action rather than puzzles in their platforming. Not only was it a pleasure to see the series reach the Game Boy Advance back in the day, it's a pleasure for gamers and Wii U owners particularly to be able to get to play the series on the Virtual Console in digital form. Anyone have some Pepto Bismol? My friend's bloating up in here! Klonoa: Empire of Dreams is somewhat of a side-story for the Klonoa series. Waking up with no knowledge of how he got there, Klonoa finds himself in the Kingdom of Jillius. Without much in the way of probable cause (unless he went robbing a batch of convenience stores in his sleep), Klonoa is taken into the kingdom castle's throne room by a duo of royal guards. It turns out the Klonoa was dreaming during his sleep, which violated one of King Emperor Jillus's kingdom's laws, and hits him home personally as the Emperor suffers from insomnia. Instead of locking Klonoa away and tossing the key, the Emperor gives him a task: defeat four turmoil-inducing monsters within the kingdom and his freedom will be honored. Given no real choice, Klonoa and his helpful bud Huepow head off to the first land posthaste. Empire of Dreams tells its playful tale through still-frame scenes, brightly colored and full of character and charm. The brunt of the story bookends the meat of the game, its platforming and puzzling fun. to raise and lower this body of water. As mentioned in the intro, Klonoa: Empire of Dreams is a mixture of platforming and puzzling. One might call it an adventure rather than a pure platformer, and that would be a fair conclusion to arrive at. 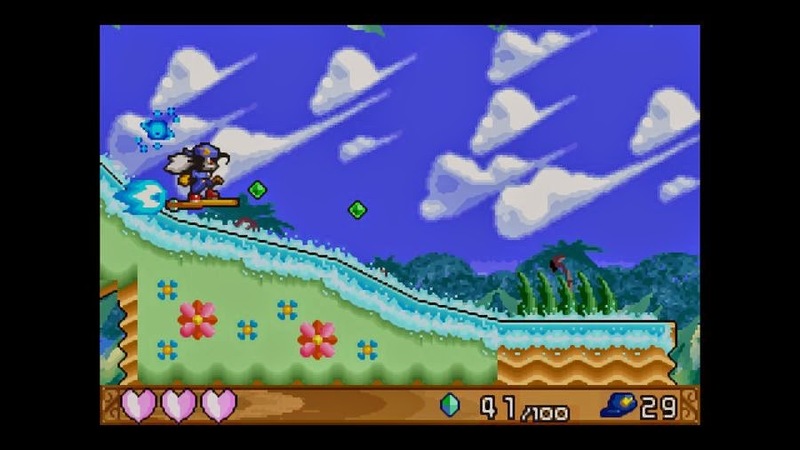 Klonoa's trademark Wind Bullet allows him to grab an enemy and either chuck it forward or use it as a clever means to double jump. This gives Klonoa access to higher up areas that he otherwise couldn't reach. With his floppy ears, Klonoa is able to flutter them to hover shortly in the air. Thanks for the lift, pal! 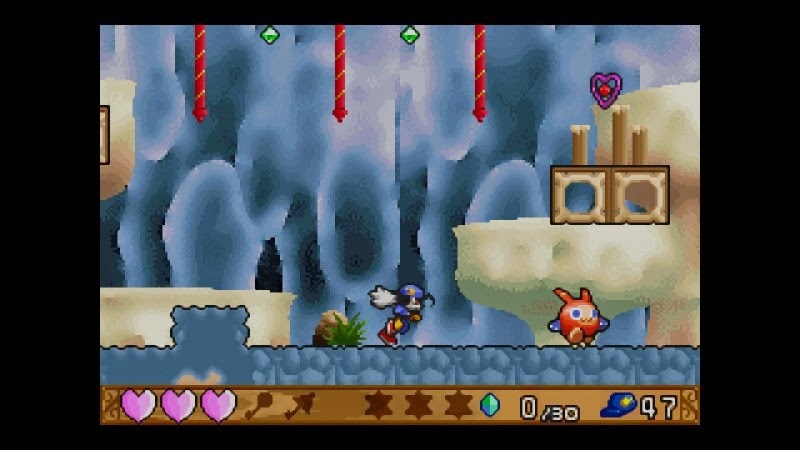 The goal of each level, or as the series calls them "visions", has Klonoa going through multiple rooms, using enemies and objects in the environment to progress. He's required to collect three star-like medallions in each level, which will then open the door to the level's exit. 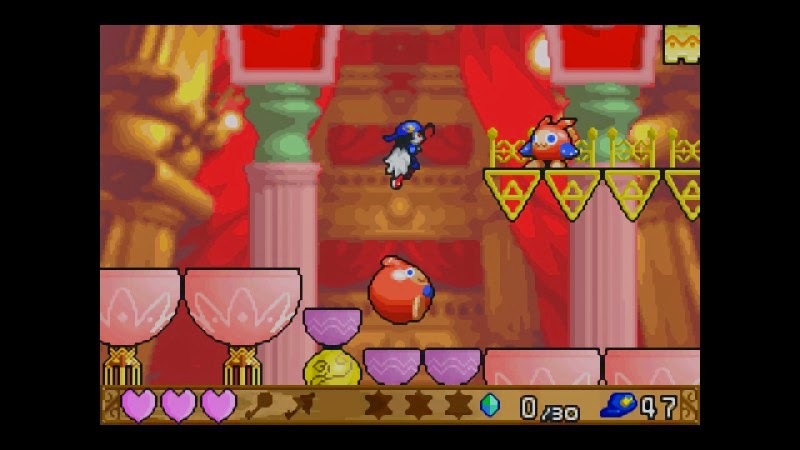 As an optional side quest, Klonoa can collect all of the gems in a level. There's a multitude of different objects and obstacles in the various levels that Klonoa comes across. For instance, there's wind channels that will blow Klonoa high up into the air. However, he is unable to cross through them. Instead, he needs to grab a large block that will weigh him down, enabling Klonoa to either stop the flow of air completely or pass through. but then I "caved." Phil: master of bad puns. 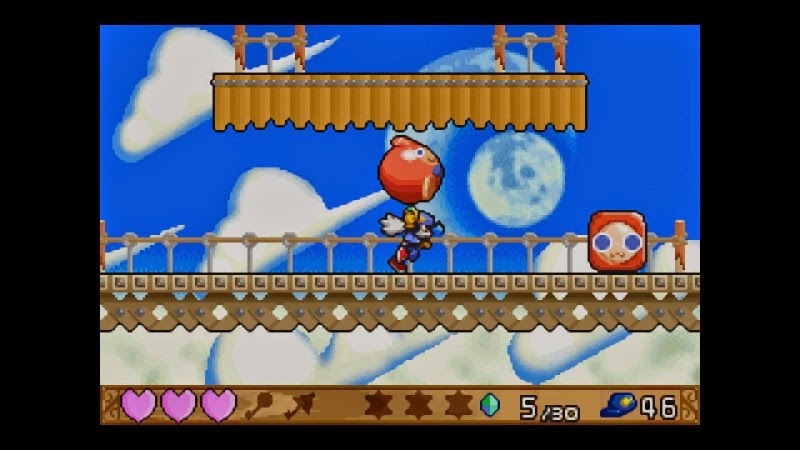 There's also platforms that act like a balance beam, albeit seemingly unconnected to the eye. When pressure is put on one, the other rises. There's enemies that serve as time bombs, counting down as soon as Klonoa picks one up. 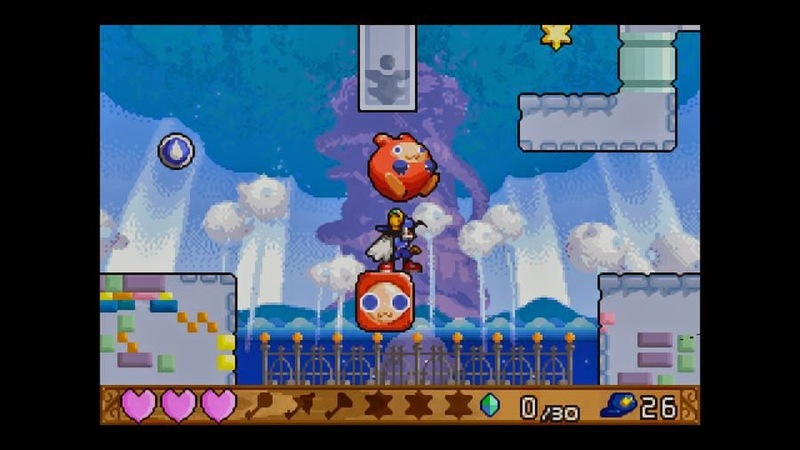 Numerous puzzles and the progress that comes from solving them revolve around carefully situating various objects to allow a path for Klonoa to get the ticking time bomb enemy to its destination. In this case, a destructible block that is otherwise impenetrable. Five lands make up Empire of Dreams, and each possesses around eight levels each, not including the ending boss fight that caps off each land. Not all stages are pure puzzle platforming. Two bonus levels appear in each land, one of which being a fast-paced hoverboard level and the other being an auto-scrolling pure-platforming affair. Both of these bonus levels are not needed to complete to beat the game, but they do offer a heavy twitch-based type of platforming that one doesn't get through the typical puzzle-based levels. Also, they are great to boost the longevity of the game! Klonoa: Empire of Dreams is the type of game that experts in the genre might not find much trouble with (though later levels do pose quite the challenge truth be told), but it's one that everyone else can not only engage their minds with but also their thumbs. As someone who would label himself as the type of gamer that's been around the block a few dozen times, Empire of Dreams was an engaging romp that plays like a dream and is designed well. It might not be as ambitious as the console entries due to obvious technical limitations, but that doesn't stop Klonoa's debut on the Game Boy Advance from being one worth one's time.